Home » WOD Blog » Paleo Potluck and Lifting Meet! Paleo Potluck and Lifting Meet! Friday, February 15th at 6pm! The Everything is Everything Nutrition Challenge details have been released! Come hang out this Friday at the Venice location to discuss the details of the Challenge and share some good food and people! If you haven’t had a chance to read our CrossFit 201 Nutrition Guide, click HERE! This is a Potluck, so be sure to bring your favorite Paleo dish to share! We will be providing the healthy fats, with bowls of Chimichurri and Guacamole. We will only be providing water, but feel free to bring cocktails as well! PLEASE NOTE IN COMMENTS BELOW WHAT YOU PLAN ON PROVIDING!! –7:15pm – Venice Barbell Club’s first Unofficial Lifting Meet (Sign up HERE)! Feel free to hang out, eat more food, ask more questions and watch people lift! 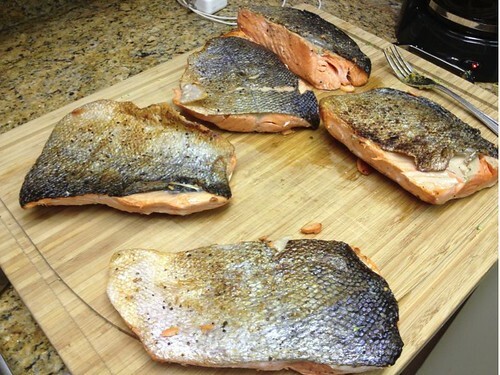 Mmmm, pan fried wild caught salmon with crispy skin…what will you be bringing?